Al looks like a sad puppy. Huh? Wha? Do we know whose doorway this is? It is the door to Robot Land. Yeah, if you look on the panel before it’s Excelsior Innovations. So this is her professor who is a Tinker with a specialization in Robotics. Not surprised but talking with another Cape should give Alison some perspective. This is pretty much the best person for her to go to. Its kind of funny how you can tell who has read Worm just about anywhere by the phrases they use to talk about super heroes. It was also on my mind in that I read the new Dungeon Keeper Ami today and the comments are how she’s sort of the anti Taylor. They both are heroic people that got slammed into the evil side but while Taylor slowly got darker Ami had refused to. Give me this. Everyone has read Worm. All humans. Thanks for the link. It was fun to read back. Amazing how much I’ve forgotten or missed. Now the question is: When is Allison going to put two and two together and realize that her medical monitor (Dr.?) has clearly had psychological persuasion on Moonshadow, if she didn’t outright put her up to it. Then the full circle would be, the old man who we saw get his throat slashed (a judge, was he?) is the Dr’s father. While a clever twist (and enjoyably dastardly, to be honest) I can’t help but think it would come off as a bit contrived. Wait? So you think that you think that the person that cut Allisons hair. Is the daughter of this couple here? Hair is the wrong color but possible. I think it would be a little bit of coincidence though. Yes! Everything about this should be positive. She just asked the mind reader to stop messing with the robot maker, plus the robot maker seemed friendly and sane. Alison badly needs to have an interaction with humans that doesn’t pressure her, and nothing about the robot maker makes me think she’s going to throw drama. Here’s hoping she can finally unwind for an hour or two, or, God willing, 8.
it really amazes me that those boxes held together for that trek. I think that’s one of her powers. Remember when she was moving that huge sciencey thing in Paladin’s lab? It didn’t break even though she was only holding it from one of the corners. All about balance…and extra durable cardboard. I’ve got a much more horrible prediction… freed of the mind maker’s many roadblock, the robot maker, unfettered at last, succeeds… at making the ROBOTS THAT WILL KILL EVERYBODY. I think this page highlights one of my favorite things that this comic does, which is emphasize that the traditional strength-and-invincibility power-set is not actually all that useful in real life. There’s no amount of strength that stops you from getting wet in the rain. She was able to carry all her stuff across town in the rain with a sprained shoulder. And her being able to carry it made a convenient excuse for her roommates to throw her out in the middle of the night. Well, she has hit rock-bottom at the last page so she can only go up from here. And I think this might be the best thing for Al. It’s less about regard and more about fear and the shame that comes with it. I’m not excusing them. I’m just saying that they know they are reacting badly, but aren’t willing to admit it. And because of that, they are trying to ignore any empathy they might normally have. Personally, I’m wondering if the friend that moved out actually moved back in of her own accord, or if the other two browbeated her into it in order to cover for their own fear. Maybe the browbeat her into it because of how bad a roommate she makes. They’re probably consoling themselves by asserting that they did what had to be done. Almost certainly. When we abuse others, as a species we, we also blame them for what we do to them. This tendency drives me nuts. Umbrella isn’t much good when you’re carrying that many boxes. Call her a cab, rather, at minimum. Having Alison around will be a help when Paladin inevitable creates a Murderbot. Next page: Paladin turns her away, for some entirely sensible and morally correct (to Paladin) reason. 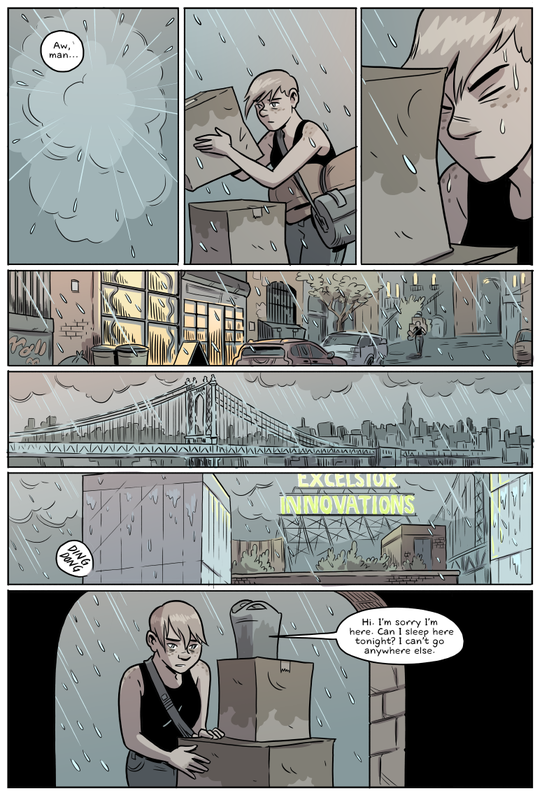 Later, a robot walks out making offhand comments about how “it never rains but it pours” and asking Allison if it’s “wet enough for her”, then collapses into a sparking pile of shorted circuits and gently rusting servos. If the narrative demands another “Alison gets thwarted in a way she can’t punch” beat, then Paladin could just not be home. She seems too, I dunno, grown-up is what I’m reaching for, to risk annoying Alison. I still find it so ironic that Alison is seeing what its like to get hit with the “Safe Space” excuse. It only worked because Alison didn’t stand up for herself. If she’d called campus security, Violet and her two friends would have been escorted out of the building. And possibly expelled, too- not just because of who Allison is, but because a lot of colleges have poor senses of humor when it comes to attempts to browbeat or intimidate a student into leaving their room. And yet Alison, being a decent and reasonable person, very likely is unwilling to turn to the school precisely because they have been unwilling to respond to her in a reasonable and proportionate way in the past. She has every reason to expect them to go entirely overboard, because that’s what they’ve done the last few times she’s has any sort of problem, and their response has actively made her situation worse. Why would she trust them? Especially in the mood she’s in now. I read the prior page as an RA/guidance counselor intervention. Besides Alison’s (ex-)roommate, were the other two women identified or recurring characters? Some days life shits on you from a great height. Surely she could have gone to the fire station? They generally have beds and internet access. I’m willing to bet that she’s thinking of Patrick right now. His original speech, about how being a superhero or villain isn’t useful for the real things in life. She can’t punch her way into acceptance, by her peers, by society. The rain falls of the invincible and the muggle alike. By contrast, I think she’s trying to not think about Patrick right now. Very very hard. She battered him last time they met, that can’t be a pleasant memory. Also, Alison’s troubles are due (in my view) to the fact that she’s STOPPED punching her way into acceptance by society/peers/etc. If she was still willing to be their murderous puppet Mega Girl would still have a place to stay at whatever facility they’d call home nowadays. She’s in the rain because refuses to punch her way to solutions, not because she can’t. I find it deeply laudable. Hats off to Alison. I really love the way the art emphasizes Allison’s facial expressions. It communicates so much emotion, without using any words. Allison definitely needs a vacation, and a chance to recover. I wonder if there’s anyone she can safely spar with – blowing off a little steam could be nice. That’s a weird way to spell Paladin. One more thing goes bad for Alison right now and I’m going to conclude that the universe hates her more than it hates Waspinator. Everybody knows the thing about “Home is where when you go there they have to let you in.”, which is actually only part of the line. Next Page: Paladin is dead on the floor, having been murdered by one of her own robots earlier that evening. This day can’t get any worse, though, right? Right? Dude, you could LITERALLY sleep anywhere you want, no one could stop you. Purposfully making life difficult for yourself is NOT noble, its just being stubborn for the sake of being stubborn! She’s a volunteer, right? I volunteered for about a year at a small fire department. They definitely had beds to crash on, and we were very gently encouraged to use them on nights that we were on call. They were reasonably comfortable and private. But I could see why she might not want to. Superheroing is what got Allison in this mess. And when she’s at the fire station she’s a super hero. She’s not exactly raring to go into a burning building or to a car wreck or medical call or what have you tonight. She probably just wants to spend some time resting and mentally digesting things. But if she were at the Fire Department, I don’t think she could say no without it becoming just another thing to be depressed about. doted on kid dynamic at the fire department, and it seems superficial. They probably wouldn’t readily understand, and Allison doesn’t relate well to biostables. But Paladin would understand, and she’s more relateable in this instance. She’s already friggin homeless, and everyone treats her like a pariah, how much worse could it get? !